Many of the riders I talk to, especially female riders, got into riding through their family or community. Motorcycles are in their blood. They’re usually excellent, heartwarming stories about familial bonding or an ambiguous “destiny,” but to be honest, they’re just not that relatable. Most people do not grow up around motorcycles. Most people do not have family that has ridden for generations. Therefore, most people never ride. I want to share my story, because my story is something “most people” can relate to. I didn’t have family that rode. My dad did, but only for a few years before I was born. I never even considered riding an option. In fact, I grew up believing I was clumsy, staying away from competitive sports and anything that required even just a bit of hand-eye coordination. I say “believing” because, when I learned to ride, I realized that my reflexes are actually pretty good, and my bike has become nearly an extension of myself. My clumsiness was just a story I made up. I also used to be part of the cultural group that believed bikes are inherently dangerous. And that’s a completely natural response when my only interaction with motorcycles was hearing about horrible accidents that happened in the news or to a friend-of-a-friend. If you only heard about car accidents and had never driven one yourself, you’d be afraid of cars, too. But once I got on a motorcycle for the first time, shifted gears and felt the wind rush over my helmeted head… I knew I had to learn. I know riding isn’t for everybody, but if you feel the pull, if you’re even halfway interested, give it a shot. Take the safety course. If you don’t like it, no worries! But if you do, your life will never be the same. The story of how I learned to ride a motorcycle is actually pretty long, so I’m going to break it up into a series. In a while I’ll post the first part, and as I post them I’ll link all of them here. 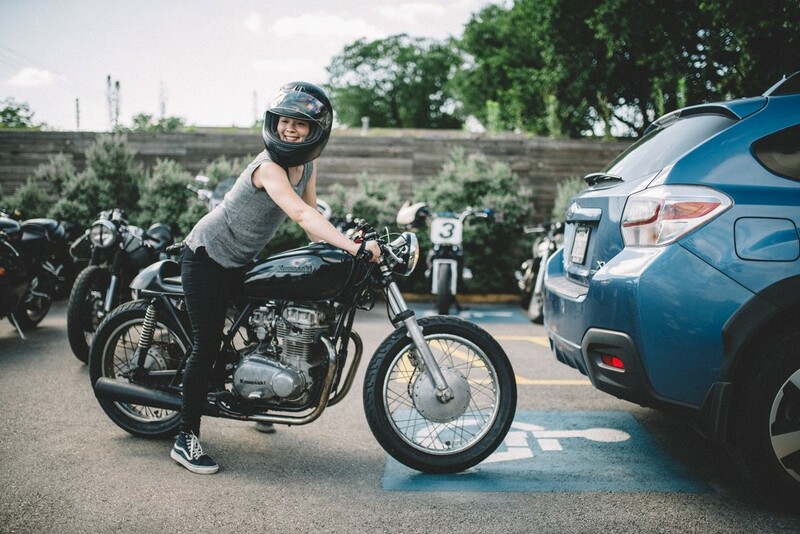 In the meantime, if you also got into motorcycles in a nontraditional way, please let me know in the comments! I’d love to hear from you. My bloodline of riding probably came from an era long ago when my dad’s vehicle of choice, when he was in the military/rebel group back in his home country, was a bright orange enduro. Since coming to the states and having me, the youngest, born in Los Angeles, the idea of riding would not be forgiven or remotely accepted. But just like the only person in my bloodline to ride, I rebelled swiftly and showed up one day with a bike. To my surprise, everyone panicked for a few seconds but gradually accepted and grew to love the bike I bought. I ride a black 1980 Kawasaki KZ440. So glad I stumbled upon your blog! Also — No way! I’m sure you saw from the photo but that’s what I ride too 😀 I just sent it off to get rebuilt today, can’t wait to see how it turns out! Looking forward to your updates! I respect everyone in the Brap community but when I see a vintage ‘saki it feels like we’re from the same small town of nowheresville. I’ve just found your blog as Knox tweeted your Levett review. It’s really good to see other female blogs about biking. You have a new fan! I started riding as my Dad rode but even then, there was still the negative opinions from some people.